I'm in South Korea now! I arrived yesterday at about 4:30pm (Korean Time). The reality of finally being in Korea hit me when I saw the Han River (한강) from the plane window. I haven't felt homesick yet. That reality hasn't struck me just yet. It took Brigritte and I over an hour to get to Gwanak-gu (관악구) via the Airport Limousine bus. I suspect it's because of traffic. I think the best way to go anywhere from the airport is by subway. It isn't affected by traffic and it gets you into Seoul much quicker. With the help of Brigritte's friend, I settled into my accommodation. I'm staying at a Goshiwon (고시원). A Goshiwon is a type of accommodation that is fairly cheap. They offer single rooms and the rooms come with a desk, fridge and bed. Some come with private toilet/shower facilites, while others don't even have windows. The cheaper ones will not have private bathroom facilities in their rooms. I didn't want to share a bathroom with about 10-20 strangers over 10 weeks, so I found a Goshiwon that had a private bathroom. The rent is ₩400,000 (which is roughly AUD$400) per month. I've found accommodation for 220,000 but they don't offer private bathrooms at all. Rent is charged per month (which is the minimum stay). This is my tiny room. I don't have space to put my suitcase anywhere other than on the ground where the walking space is (this is mostly because my suitcase is massive). I may do a more detailed post about accommodation in Korea later; just leave a comment below if you're interested! Totoro slippers that were gifted from my friend John :) A little something to remind me of home. Dinner, night 1 was at a kimbab restaurant. There are a lot of these types of restaurants around. They're cheap and they're not bad in terms of quality. It resembles home cooked food for me so I was quite happy with it. I also got a T-money card. T-money card works very much like a Myki in Melbourne (you touch on and off when you're on public transport). However, it works so much better than Myki (which isn't hard since the Myki system is total rubbish). You can also use these in convenience stores and the like too. You can buy them from machines at subway stations or from convenience stores. It comes in a little box which I found totally adorable. Today was the day of the placement test. This determines which level program we should be doing. To be perfectly honest, my Korean skills are terrible so I wasn't expecting to make it to level 2. I find learning languages especially difficult for some reason. I've always been a fast learner and the fact that I found learning a language really difficult was discouraging. But I'm determined to do well and consolidate my (very) shaky foundation. Before the test though, I went for breakfast at Paris Baguette. Paris Baguette is very much like Breadtop, Bread Kingdom and Hana Bakery in Melbourne. Paris Baguette is everywhere. My breakfast consisted of a Croque Monsieur (which is a French ham and cheese sandwich) and a latte. I didn't notice that the coffee isn't as rich as what I'm used to in Melbourne because of the sugar I put in it. They have a tendency to make the milk really hot for some reason. After the placement test, I went shopping for some homewares and stationery (which I will feature in a later post) and ate lunch - 자장면! 자장면 (jajangmyeon) is basically black bean sauce on top of noodles. It's derived from the Chinese 炸酱面 but it's a little different. One of the more interesting finds at the convenience store. 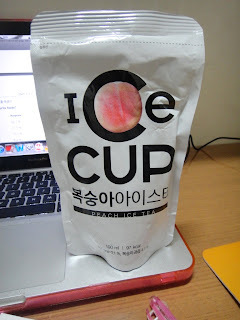 Peach iced tea in a bag! It's really sweet though, even more so than the Lipton/Nestea ones at home. Day 2 dinner was chicken from hell. We (the 6 of us that came from Melbourne) wanted to eat chicken. Passing by the KFC, we went to a chicken restaurant and ordered two of these. We didn't realise at the time how big the servings were. I think in general, the serving sizes in Korea are a lot bigger than what we expect them to be at the price that they are. At first glance, I saw all the chillies in the dish and doubted my ability to actually eat it. It's like a tiny step down from Crazy Wings. My lips were prickling and burning. I couldn't stand it after eating about 2 pieces of chicken. Saaya and Brigritte steadily ate (spicy tanks!) and we managed to finish one plate as well as a third of the second plate. I ended up getting some stuff from Paris Baguette for dinner.